If the two Canadian provinces and eight U.S. states that make up the Great Lakes-St. Lawrence Seaway region formed their own country, it would boast the world’s third largest economy. That was one of the notable observations in a recent report commissioned by Chamber of Marine Commerce, an Ottawa-based bi-national association representing shipowners and operators, ports, shippers, and other marine-related companies. The region’s annual GDP of over US$6 trillion — exceeded only by the U.S. and China — includes domestic cargo moved on either side of the border, and cargo bound for or arriving from overseas. But a fair chunk of that is trade across the border — trade that many transportation industry insiders and experts fear will suffer from the tariff war that has erupted between Canada and the U.S. In June, U.S. President Donald Trump, citing slow progress on renegotiations of the North American Free Trade Agreement, lifted a temporary exemption he had granted Canada, Mexico and the European Union from a 25 per cent tariff on steel and a 10 per cent tariff on aluminum. Canada responded in July with tariffs of its own, including on steel and aluminum as well as a range of other products such as whiskies, with the latter clearly aimed at the Trump-supporting bourbon-producing states of Kentucky and Tennessee. Bruce Burrows, Chamber President, said about 59 million tonnes of cargo crossed the border by water in 2017. That represented about 15 per cent of the total business on the system, he said. In 2017, the system’s 40 ports — 21 in the U.S. and 19 in Canada — handled 381 million tonnes. But that included cargo that remained in the waterway and was loaded at one port and unloaded at another. Total cargo that traversed the system was 230.9 million metric tonnes in 2017. The study — prepared for the chamber by Martin Associations of Lancaster, Pa. — focused on the seaborne trade, Mr. Burrows pointed out. Those commodities are predominantly bulk — such as iron ore, steel, grain, salt, and aggregates. Many other high-value products — such as auto parts and automobiles — cross the border by train and truck. Figures in the report indicate that most of the cross-border trade is from Canadian-flagged vessels. “Our Canadian fleet is much more active in cross-border to the U.S. than the American fleet, which is about half the size,” Mr. Burrows said. That Canadian fleet numbers about 80 ships compared with about 45 for the U.S., he said. The Canadian ships are also more modern “because we’ve invested billions of dollars in new eco ships,” Mr. Burrows said. The U.S. fleet meanwhile tends to stick to its domestic trade, he said. The report bears that out, noting that lake revenue between U.S. ports is nearly double that of the laker revenue between Canadian ports “primarily due to the higher volume of cargo moving on lakers to U.S. ports compared to Canadian ports.” For the marine industry on the Great Lakes/Seaway, 2017 “was our final sign that we were out of the recession,” Mr. Burrows said. The recession had hit the industry hard but business increased nine per cent in 2017, he said. A cold winter stalled the momentum this spring as it delayed the Seaway opening. But in recent weeks, traffic is tracking 2017 volumes. “Obviously we don’t want to see it tick down again,” Mr. Burrows said. So far, he and others haven’t detected a drop in cross-border trade because of the tariffs. It’s simply too early to tell. Another long-standing challenge to trade on the Great Lakes-Seaway is the effort to harmonize the complex and often conflicting regulations of national, provincial, state, and local jurisdictions. That was the subject of a 15-page June 2018 report from the Council of the Great Lakes Region. “Governments want to make a difference and to be seen as responsible leaders in regulating commerce, protecting human health and consumers, and conserving the environment,” that report noted. “This can lead to regulatory misalignment, which results in unnecessary costs and administrative burden.” That issue, though, has been overshadowed by the concerns over tariffs, which the report prematurely stated had all but been eliminated during the last three decades by the World Trade Organization. Historically, the biggest chunk of Hamilton’s business is in steel and the raw materials used to make it. Volumes in that category rebounded slightly in 2017 to 6.8 million tonnes from around 6.4 million tonnes in 2015 and 2016. According to the Canadian government’s Trade Data Online website, the value of exports of steel and iron from Ontario to the U.S. Great Lakes region were higher in March, April and May 2018 compared with the same months in 2017. For example, those exports totalled $378 million in May 2018 compared with C$300 million in May 2017. Exports in June 2018 from Ontario to the U.S. Great Lakes, however, were only marginally higher than in June 2017. In addition, exports of steel and iron from Ontario to the entire U.S. dropped this June 2018 compared with June 2017 to C$476 million from C$517 million. Imports of steel and iron from the U.S. into Ontario spiked in June 2018 compared with June 2017 rising to C$492 million from C$377 million. That happened in advance of Canada’s retaliatory tariffs that took effect July 1. The tariffs aside, the steel sector isn’t as dominant at Hamilton as it was in 2005 when it accounted for 10.3 million tonnes, representing about 83 per cent of the port’s total volume of 12.4 million tonnes. In 2017, the steel sector made up around 69 per cent of total volume. The reduction coincided with China’s rise as the global steel superpower. But it also reflected greater diversity in the products that go through Hamilton. In particular, grain volumes soared to 2.3 million tonnes in 2017 from 492,272 tonnes in 2005. That shift has also enabled Hamilton to lessen its dependence on U.S. markets. “Hamilton is probably geared up to do 2.5 million tonnes of agricultural exports and they’ll all be to overseas markets,” Mr. Hamilton said. That includes grain as well as fertilizers such as potash. Helping fuel that growth is the Canada-European Union’s Comprehensive Economic and Trade Agreement, or CETA, that went into force in September 2017. He described the CETA terms and the U.S. tariffs as complementary forces. On the other hand, the U.S. economy is firing on all cylinders, having posted annualized gross domestic product growth of 4.1 per cent during the second quarter of 2018, the highest growth rate since 2014, and record low unemployment. President Trump has taken credit for the boost. The new tariffs on steel, however, represent “a very significant drag on the economy” of the Great Lakes region, said Dr. Bill Anderson, Director of the Cross-Border Institute at the University of Windsor. “Why did this become a great industrial region? It was really because of the fact that you could bring the iron ore by water down to the cities of the Great Lakes and you could bring coal up from the Appalachian region and you could make steel,” said Dr. Anderson, who is an economic geographer. Over time, and especially since NAFTA, steel production became specialized with factories on either side of the border making different grades that would be sold in both countries rather than companies engaging in head-to-head competition. “But it’s actually mutually beneficial because it allows those firms to specialize and operate on a larger scale,” Dr. Anderson said. Ultimately, the steel tariffs will eliminate the specialization, reduce the economies of scale, and result in a less efficient system, he said. The aluminum tariffs, meanwhile, will increase the cost to U.S. buyers on a product that is far less expensive to produce in Canada because of its availability of inexpensive hydroelectric power. Still, despite being an economic drag, the steel and aluminum tariffs alone won’t kill the economy. “I think the biggest threat is the possibility of having tariffs on automotive products,” Dr. Anderson said. “That’s the one that everyone should be worried about.” It’s not an idle worry. Mr. Trump has threatened to impose such tariffs. Were that to happen, it would unravel half a century of supply chain integration dating back to the signing of the original Auto Pact in 1965. Under the deal, the major auto makers established factories in Canada and the U.S. to manufacture certain makes and models for the entire North American market. For example, in Windsor, where Dr. Anderson has his office, Fiat Chrysler operates a plant that churns out 1,500 minivans a day and employs 5,000 people, Dr. Anderson noted. These vans compete with vans built by Toyota and Honda in the U.S. Accordingly, a tariff of 25 per cent on vans assembled in Canada and exported to the U.S. would render them non-competitive against models made in the U.S.
Should a tariff be applied to auto parts, the potential disruption would be even greater. It has been widely reported that the average auto part crosses the border seven times before the finished vehicle is sold. Dr. Anderson said he doesn’t know the origin of that number but described it as “not a crazy number.” The problem with tariffs is that they are an “ad valorem” levy, which means they are applied each time a product crosses the border. “So every time it goes across, you’re paying the tax on the entire value of the goods that are going across,” Dr. Anderson said. That’s significantly different from a value-added tax, such as the GST, which allows businesses to deduct the GST they pay on their inputs, which reduces the cascading effect. So far Dr. Anderson hasn’t noticed any fallout from the tariffs — except that they have a lot of people worried. For now, he can still watch from his office as trucks carry those minivans across the Ambassador Bridge. Builders of custom work trucks and trailers are in a similar quandary. It’s not as pronounced as in the auto sector but a work truck will typically cross the border up to four times during manufacture and upfitting, noted Don Moore of the Canadian Truck Equipment Association. “There is a lot of uncertainty as to what the effects will be,” said Mr. Moore, Director of Government – Industry relations for the association, which represents some 510 member companies, about 80 in the U.S. Some member companies are even contemplating shutting down because they wouldn’t be able to raise prices enough to remain viable and profitable, he said. It’s not just Canadian equipment manufacturers who object to the tariffs. The National Truck Equipment Association, which represents more than 2,000 companies, called for a permanent exemption for Canada and Mexico. And the Association of Equipment Manufacturers — whose 900 plus members include Caterpillar, Deere & Company, and Volvo — produced a TV ad featuring manufacturing workers pleading with President Trump to eliminate the tariffs in order to protect their jobs. Mr. Moore, who is also based in Windsor, said he hasn’t noticed a drop yet in cross-border trade. But he expects it’s only a matter time before that happens and prices start to rise. “It’s so tempting for some companies to try to take advantage of it early to bump their prices because of the expectation that the supply is going to drop,” said Mr. Moore, who stressed that he was voicing personal opinions and not necessarily the position of his association. Mr. Burrows at the Chamber of Marine Commerce, however, suspects that one reason the tariffs haven’t yet had a great negative impact is that many companies are absorbing the cost of the tariffs and not yet passing them along their customers. “Obviously you can’t continue to do this forever,” Mr. Burrows said. While the Chamber’s stakeholders don’t move a lot of automobiles or auto parts, they nevertheless play “a very significant role” in the auto supply chain “because we’re feeding the input materials,” Mr. Burrows said. That includes moving aluminum from Quebec to ports such as Oswego in New York State. “We’ve got a real advantage because we can move that aluminum most cost-effectively and with the lowest transportation emissions footprint,” Mr. Burrows said. Mr. Burrows noted that Mr. Trump’s motivation in slapping the tariffs on was to reinvigorate the U.S. steel industry. There is evidence that some U.S. steel plants have reopened. For example, U.S. Steel Corporation in Granite City, Illinois, returned 500 employees to work earlier this year and will put 300 more back to work when a second blast furnace restarts in October, according to a Yahoo News report. But Mr. Burrows said he hasn’t seen any effects of that yet on demand for Canadian steel. “It’s hard to suddenly change your supply chain overnight and find new suppliers in that context,” he said. The tariffs are also having an impact on freight forwarders, said Ruth Snowden, Executive Director of Canadian International Freight Forwarders Association. 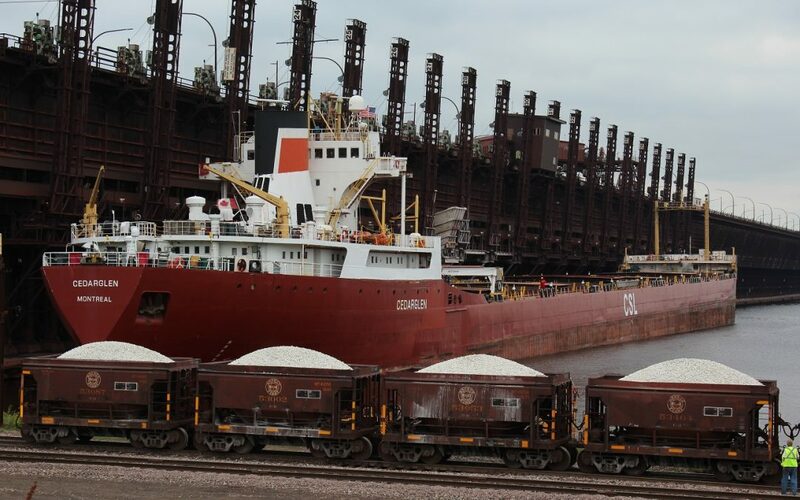 Freight forwarders aren’t too involved in movement of bulk goods on the Great Lakes/Seaway waters. But they do a lot of work in the auto sector. For that reason they “would be extremely negatively impacted” by those threatened tariffs, Ms. Snowden said. “Even with the steel and aluminum and the very specific Canadian tariffs being applied, certainly that consumed a lot of time and energy by member firms, particularly those who also operate as customs house brokers,” Ms. Snowden said. “They had to revise all of the line codes in their systems to account for the new applications of rates of duty.” The tariffs have also affected lines of credit of their customers, who now have to pay duty. “So everybody has been scrambling to get their credit resources in line and to have importers posting bonds,” Ms. Snowden said. Another twist to the tariffs is that they are making Canadian agricultural products, such as corn and soya beans, more attractive to customers in Europe and Asia. That’s because of retaliatory tariffs placed on those goods from the U.S. “The Europeans are now looking to Canada to buy corn and we’re looking to move a lot of that by ship,” Mr. Burrows said. He hasn’t noticed a big shift yet, in part because European customers bulked up on U.S. corn in advance of the tariff. However, Trade Data Online figures reveal that Canada’s corn exports to Spain spiked to C$26 million in May 2018, up from C$6.7 million in April 2018 and C$7.5 million in May 2017.